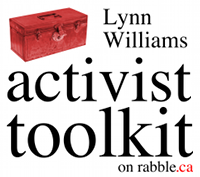 Welcome to the Lynn Williams Activist Toolkit, an exciting new project of rabble.ca currently in Beta. The Toolkit is a wiki-style section of the rabble site devoted to content collaboration. It contains a growing number of encyclopedic resources that you can write. The Toolkit is named after activist, organizer, and labour leader, Lynn Williams, whose commitment to social justice has inpired generations of United Steeworker activists. Read more about Lynn Williams here. Participate in the Toolkit! See our User Guide, and please check out the toolkit blog and podcast. What is the impact of the extractive oil industry on our health? For commmunities living near oil fields and pipelines, this initiative is looking into an important question. Did you read the Truth and Reconcilliation report? Help ensure the resources for gender-affirming care. Lift the cap, it's only fair! Now we have to pressure the federal government to step away from its memorandum of understanding with Israel. What happens to TFWs and service workers displaced from Fort McMurray? Some may not qualify for EI, others are on closed work permits. Ask the government to make sure they are supported. Israel is now demanding that the Palestinians celebrate instead of mourning! We need to demand more and get involved if we want to see real change. Join the thunderclap on May 14 to make the government take action! Read Maher Arar's letter about what his new tool means for us. Another earthquake just struck Ecuador's coast. Here's how to help. Here's how Canadians can get involved and help. Prince's sudden death at 57 had left many of us reeling. Here's what you can do to honour his legacy. Here are some of the commitments that you can deepen this Earth. It was wrong when Harper agreed to it, it is wrong as the Trudeau government continues to pursue this awful deal. Find out about events in your community and join the movement. Thomas Mulcair will be stepping down as leader. What next? What we know about next steps and how to get involved in rebuilding the party. The organizers are hosting community meetings, volunteer training and more. Get involved to make this event spectacular! Joseph Stiglitz is calling on Canada to push for renegotiating the treaty. Here are some tools to keep the pressure on. No more deaths! End indefinite immigration detention! Fourteen people have died in detention since 2000, two this month. Canada needs to end indefinite immigration detention now! On Saturday, take action against police violence. Take action against anti-black racism.